When you upgrade on JibberJobber you get a few things… including the new JibberJobber Video Library. This is a killer value because before it used to be $50 per course, but now all courses in the library are included, plus JibberJobber Premium Features for a year, for only $60. I recently fixed video 03 of the new LinkedIn course, which is about the Above the Fold part of your LinkedIn Profile. The wrong video had been there before (sorry!). 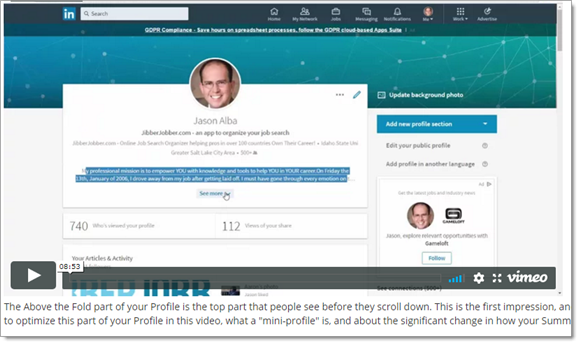 This video is eight+ minutes of how to optimize the top part of your Profile, from the Picture to your name (an SEO trick?) to your professional headline to your summary (new info!!) to more. $60 gets you that, and the other courses, plus Email2Log, importing, email reminders, and no limits on Contacts and Companies records.